A Postdoctoral position is available to work in a recently granted TUBITAK project (2019~2021) entitled “Point-of-Care multiplexed detection of Alzheimer’s disease biomarkers using magnetic-quantum dots for early diagnosis of mild cognitive impairment and dementia in elderly people” at Sabanci University Nanotechnology Research Center (SUNUM), Istanbul. Candidates who wish to apply can contact via email to sunum@sabanciuniv.edu (cc to javed@sabanciuniv.edu) with an updated CV and a full list of publications stating any scientific publication on which the applicant wishes to rely. 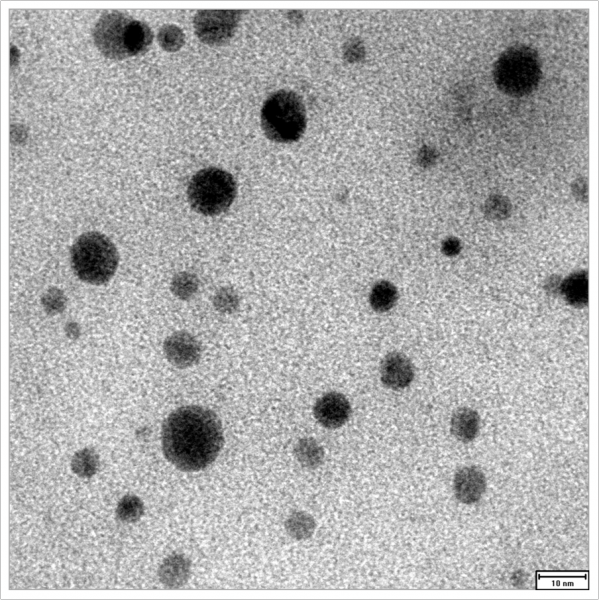 The applicant must have a strong background in chemical synthesis of organic/inorganic nanoparticles (quantum dots) as well as their characterization. Undergrads (2 part-time) and PhD (1 full-time) positions are available: aspirants can visit here for the regular Admission Requirements for Graduate School of Engineering and Natural Sciences of Sabanci University, or previously registered in any of the universities in Istanbul area. 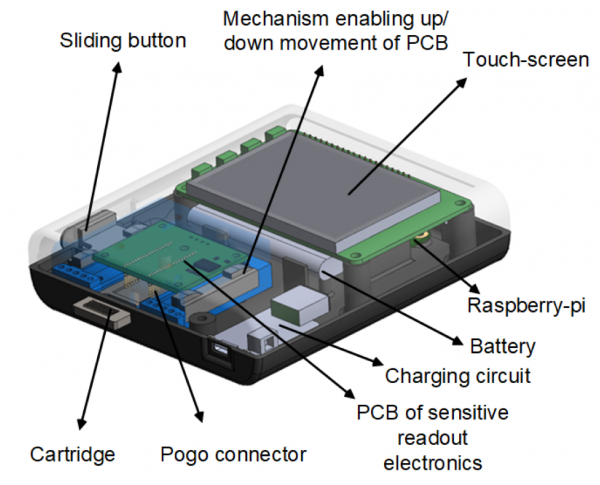 Ref: Omer Ceylan, Geetesh K. Mishra, Melik Yazici, Anjum Qureshi, Javed H. Niazi, Yasar Gurbuz (2018) A Hand-Held Point-of-Care Biosensor Device for Detection of Multiple Cancer and Cardiac Disease Biomarkers using Interdigitated Capacitive Arrays. IEEE Transactions on Biomedical Circuits and Systems, 12(6), 1440-1449. Ref: Niazi S, Purohit M, Niazi JH (2018) Role of p53 circuitry in tumorigenesis: a brief review. European Journal of Medicinal Chemistry 158, 7-24. 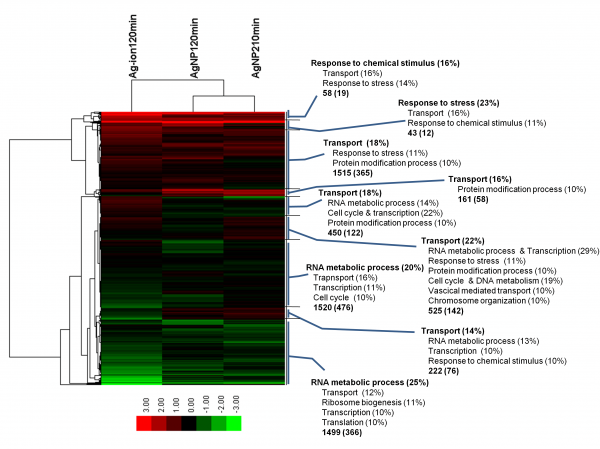 Ref: Niazi S*, Purohit M, Sonawani A, Niazi JH* (2018) Revealing the molecular interactions of aptamers that specifically bind to the extracellular domain of HER2 cancer biomarker protein: An in silico assessment. 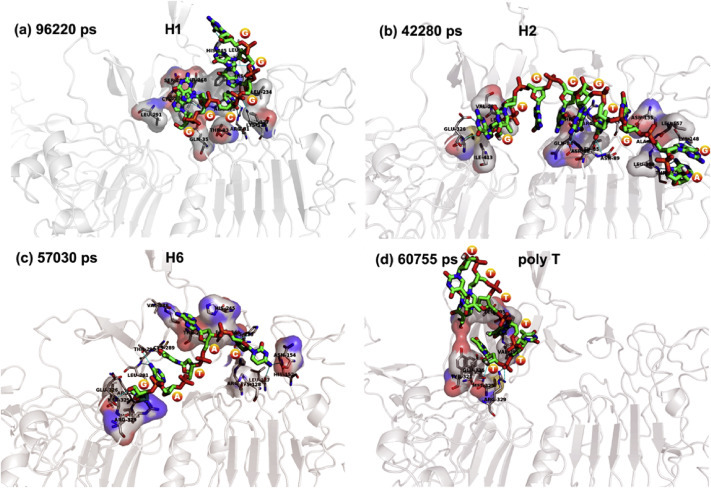 Journal of Molecular Graphics and Modelling 83, 112-121. Ref: Saz M, Siddiq M, Niazi JH, Qureshi A (2018) Role of quaternary ammonium compound immobilized metallic graphene oxide in PMMA/PEG membrane for antibacterial, antifouling and selective gas permeability properties. Polymer Bulletin 1-18. Ref: Chouhan RS, Niazi JH, Qureshi A (2018) Development of immunoblot assay for carcinoembryonic antigen (CEA) in human serum using portable UV illuminator. Analytical Methods 10, 947-949. 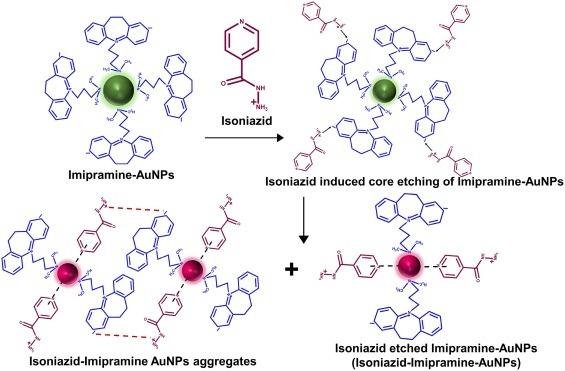 Ref: Shaikh T, Pandey A, Sirajuddin, Talpur FN, Kaushik A, Niazi JH* (2017) Gold nanoparticles based sensor for in vitro analysis of drug-drug interactions using imipramine and isoniazid drugs: a proof of concept approach. Sensors and Actuators B. Chemical 252, 1055-1062. 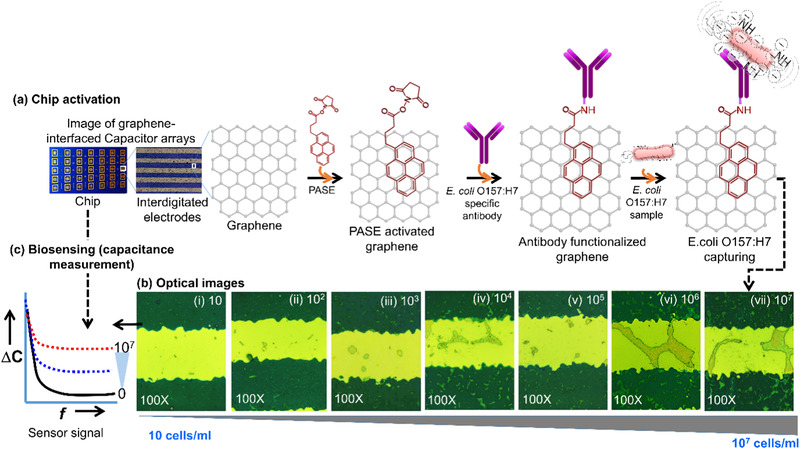 Ref: Pandey A, Gurbuz Y, Ozguz V, Niazi JH* and Qureshi A* (2017) Graphene-interfaced electrical biosensor for label-free and sensitive detection of foodborne pathogenic E. coli O157:H7. 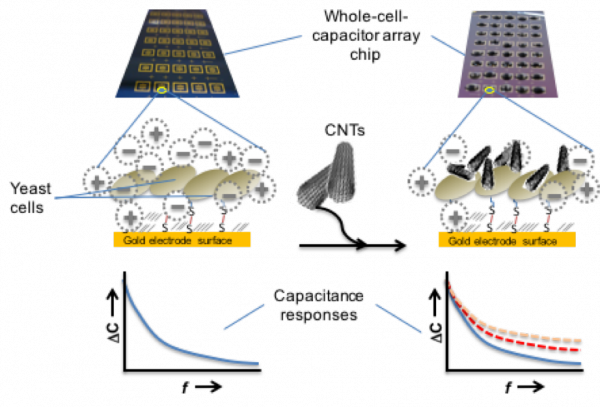 Biosensors and Bioelectronics. 91, 225-231. Ref: Bharadwaj S, Mitchell RJ, Qureshi A, Niazi JH* (2017) Toxicity evaluation of e-juice and its soluble aerosols generated by electronic cigarettes using recombinant bioluminescent bacteria responsive to specific cellular damages. Biosensors and Bioelectronics 90, 53-60. Ref: Chouhan RS, Panday A, Qureshi A*, Ozguz V, Niazi JH* (2016) Nanomaterial resistant microorganism mediated reduction of graphene oxide. 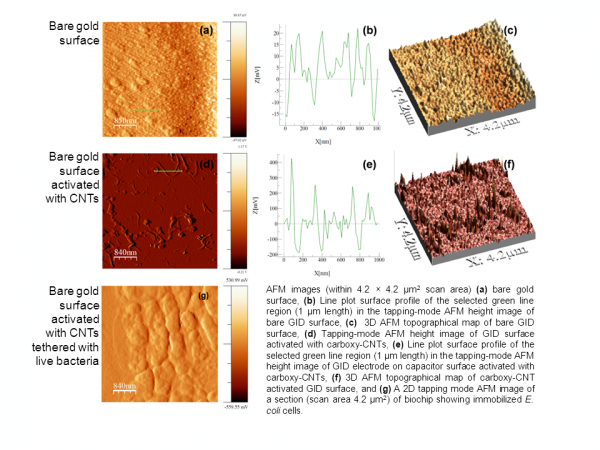 Colloids and Surfaces B: Biointerfaces 146, 39-46. 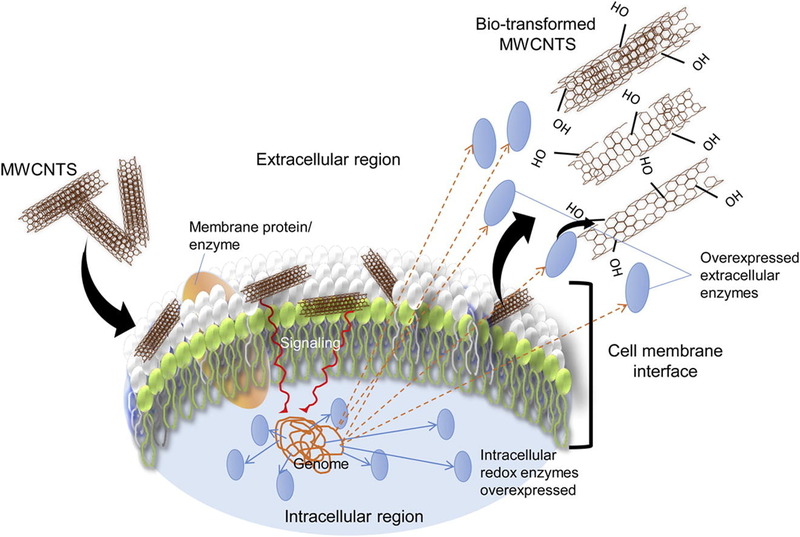 Ref: Chouhan RS, Qureshi A, Yagci B, Gülgün MA, V Ozguz, Niazi JH* (2016) Biotransformation of multi-walled carbon nanotubes mediated by nanomaterial resistant soil bacteria. Chemical Engineering Journal, 298, 1-9. Ref: Niazi JH*, Pandey A, Gurbuz Y, Ozguz V, Qureshi A (2016) Cells-on-chip based transducer platform for probing toxicity of metal nanoparticles. Sensors and Actuators B: Chemical, 231, 659–665. 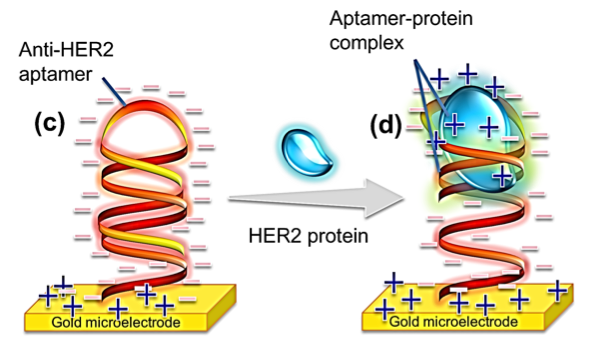 Ref: Qureshi A*, Gurbuz Y and Niazi JH* (2015) Label-free capacitance based aptasensor platform for the detection of HER2/ErbB2 cancer biomarker in serum. Sensors and Actuators B. Chemical 220, 1145-1151. 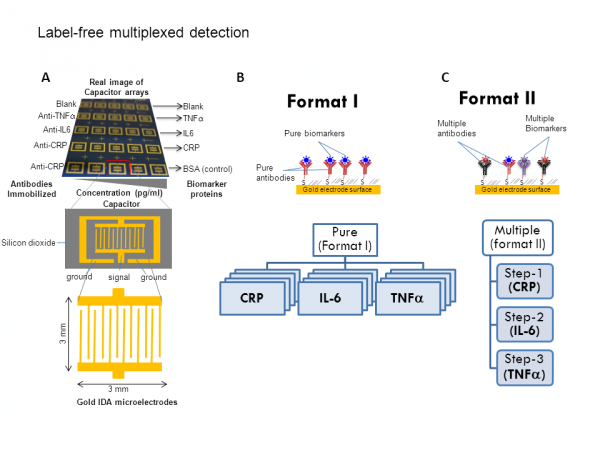 Ref: Pandey A, Chouhan RS, Gurbuz Y, Niazi JH* and Qureshi A* (2015) S. cerevisiae whole-cell based capacitive biochip for the detection of toxicity of different forms of carbon nanotubes. Sensors and Actuators B. Chemical, 218, 253-260. 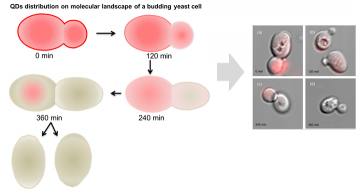 Ref: Chouhan RS, Qureshi A and Niazi JH* (2015) Determining the fate of fluorescent quantum dots on surface of engineered budding S. cerevisiae cell molecular landscape. Biosensors and Bioelectronics 69, 26-33. 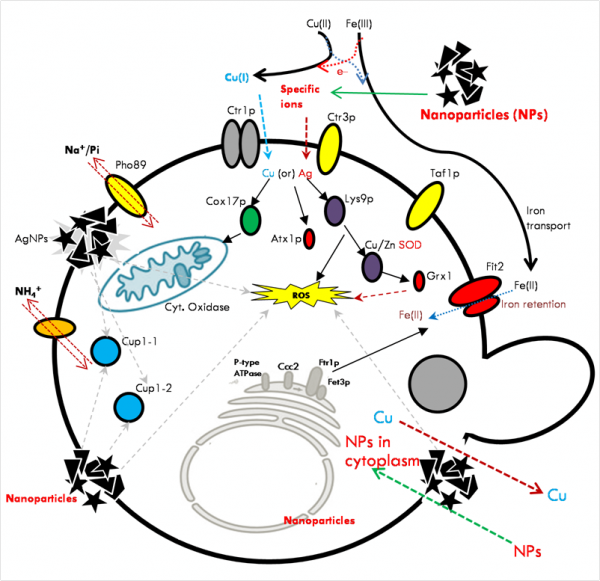 Ref: Chouhan RS, Qureshi A*, Niazi JH* (2014) Quantum dot conjugated S. cerevisiae as smart nanotoxicity indicators for screening toxicity of nanomaterials. Journal of Materials Chemistry B, 2, 3618-3625. 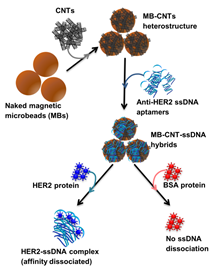 Ref: Niazi JH*, Verma SK, Niazi S and Qureshi A (2015) In vitro HER2 protein-induced affinity dissociation of carbon nanotube-wrapped anti-HER2 aptamers for HER2 protein detection. Analyst, 140, 243-240. 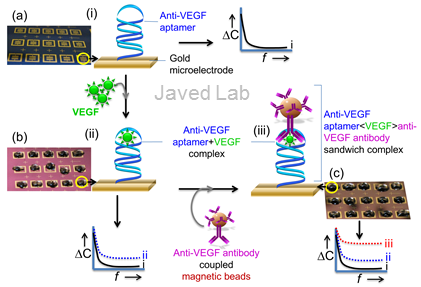 Ref: Qureshi A*, Gurbuz Y and Niazi JH* (2015) Capacitive aptamer-antibody based sandwich assay for the detection of VEGF cancer biomarker in serum. Sensors and Actuators B: Chemical, 209, 645-651. Ref: Qureshi A,* Pandey A, Chouhan RS, Gurbuz Y, and Niazi JH* (2015) Whole-cell based label-free capacitive biosensor for rapid nanosize-dependent toxicity detection. 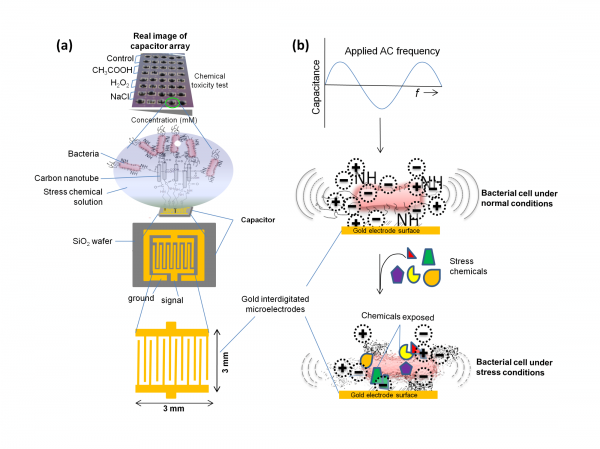 Biosensors and Bioelectronics, 67, 100-106. 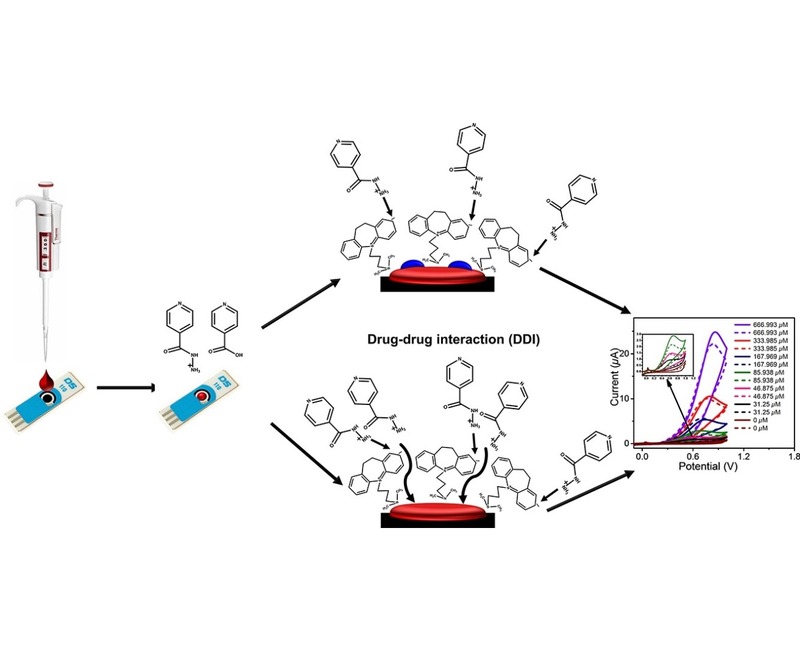 Ref: Chouhan RS, Niazi JH*, Qureshi A* (2014) Chemical toxicity detection using quantum dot encoded E. coli cells. Sensors and Actuators B: Chemical 196, 381-387. 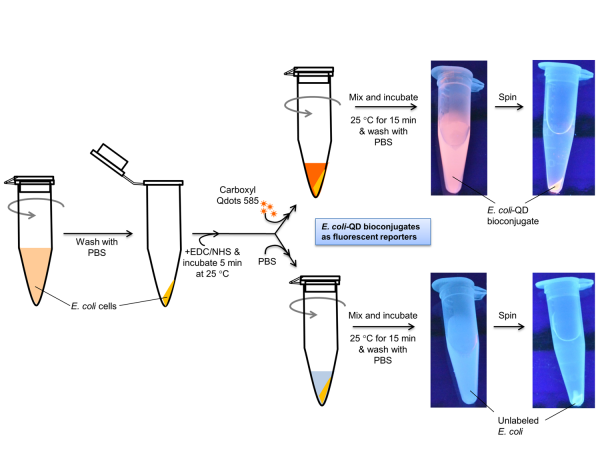 Ref: Chouhan RS, Niazi JH*, Qureshi A** (2013) E. coli-quantum dot bioconjugates as whole-cell fluorescent reporters for probing cellular damages. Journal of Materials Chemistry B,DOI:10.1039/C3TB20338G (Just Accepted). 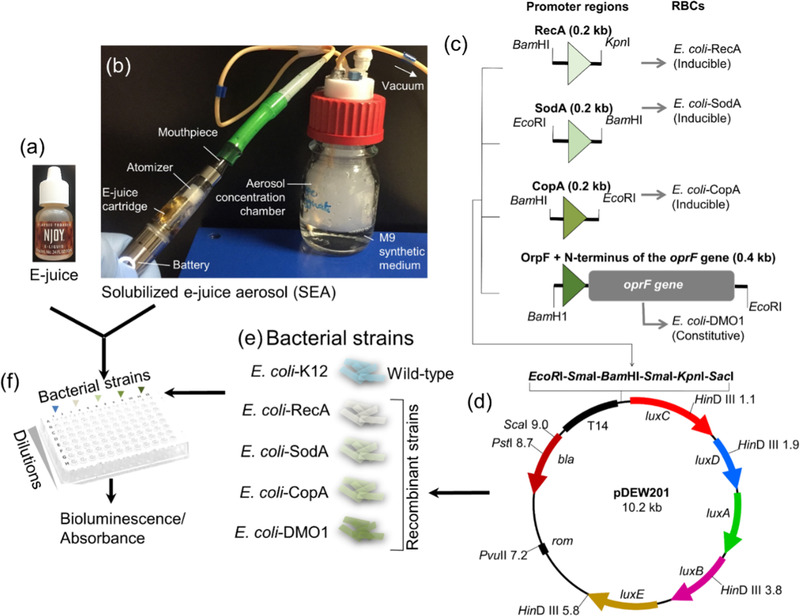 Scheme for chemical coupling of Quantum Dots on E. coli cell surfaces. Image Below: Confocal microscopic images of E. coli-QD bioconjugates taken (a) under normal light, (b) after the laser excitation on E. coli-QD bioconjugates and overlayed, (c) loss of fluorescence due to the presence of CNTs after the laser excitation on E. coli-QD bioconjugates and (d) Fluorescence emission spectra of E. coli-QD bioconjugates with or without CNTs incubation showing complete disappearance of fluorescence emission. The fluorescent spectra shown in red and green colors were obtained against PBS as blank. Normalized curves seen in the spectra were obtained when unlabeled E. coli cells were used as control (blank). 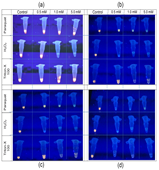 The inset images show the UV-exposed glass slides spotted with E. coli-QD bioconjugates and incubated by mixing with different ratios of CNTs with respect to QDs (QD:CNT = µM:µg) as indicated in the inset legend. 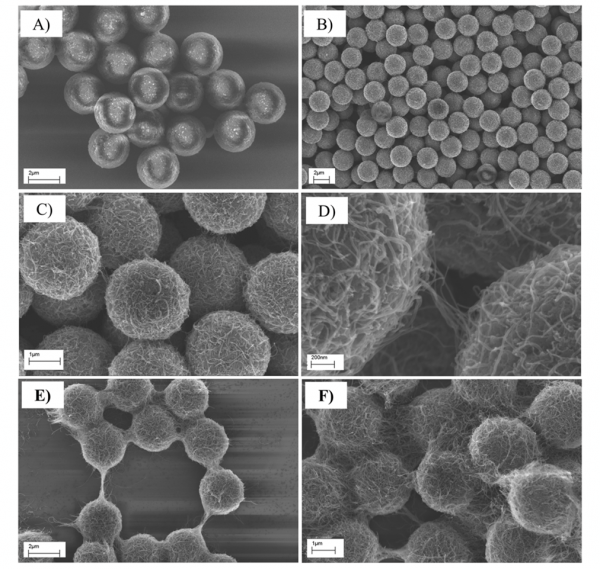 SEM images of naked magnetic microspheres (A), microspheres coated with 0.1 mg CNTs/ 107 microspheres (B, C, D), and microspheres coated with 1 mg CNTs/ 107 microspheres (E, F). 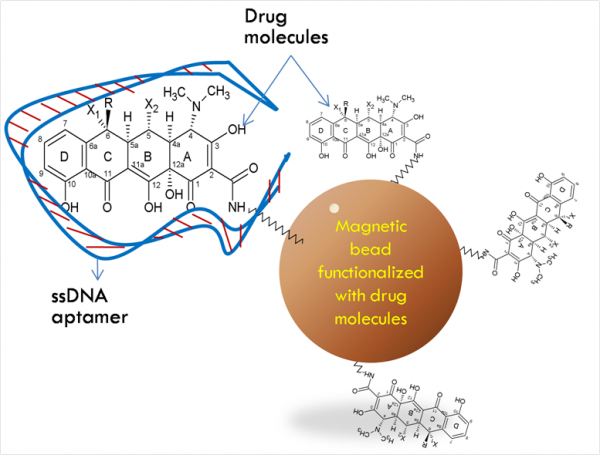 Ref: Unal H, Niazi JH* (2013) Carbon Nanotube Decorated Magnetic Microspheres as an Affinity Matrix for Biomolecules. Journal of Materials Chemistry B, 1, 1894-1902. Ref: Qureshi, A., Gurbuz, Y. and Niazi, J.H. 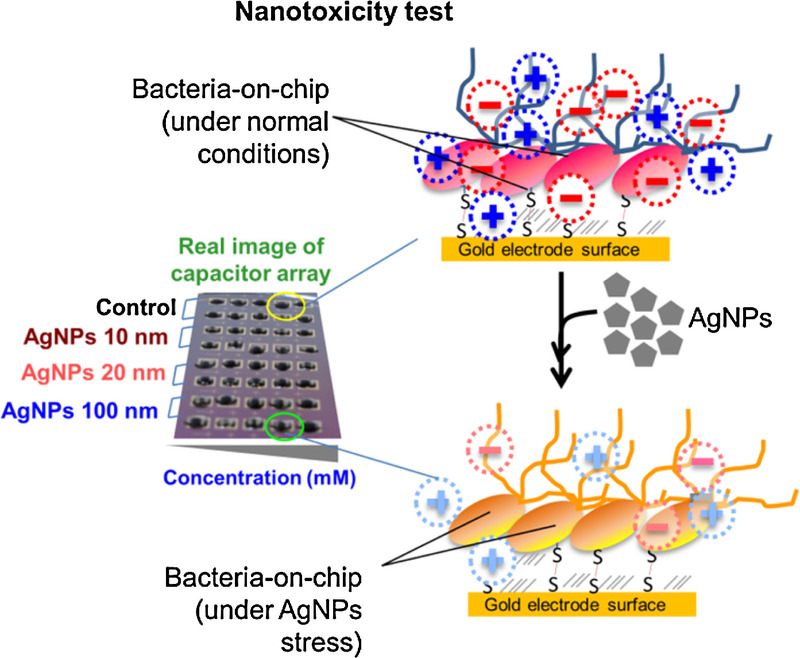 *(2011) Probing chemical induced cellular stress by non-Faradaic electrochemical impedance spectroscopy using Escherichia coli capacitive biochip.